Microsoft is definitely on the warpath when it comes to promoting Edge, as we recently heard claims about how it's the best browser for battery life, and now the company is saying that Windows 10's browser is top dog when it comes to the quality of streaming video on your PC, too. 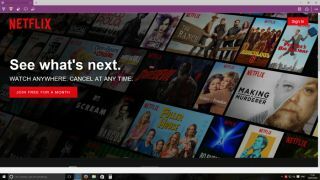 Redmond has pointed to video tests run with Netflix which found that the service streamed at full 1080p with the Edge browser, but only 720p resolution in Chrome, Firefox and Opera. Edge also achieved a higher maximum bitrate (7,500 compared to 4,420 for its browser rivals). The long and short of it is, you have to watch Netflix on Edge to get the maximum viewing quality possible. And PC World, which spotted this development, separately confirmed that Microsoft's observations are correct. Redmond talked more about its recent battery life tests where Edge outdid all the competition – and positively blew away Chrome, lasting 70% longer – noting that the Windows 10 browser's achievements are even more remarkable given that it was drawing more power to stream in 1080p (with the others in 720p). So, it would seem that avid Netflix watchers have a good reason to upgrade to Windows 10 if they're still on the fence (with the impending free upgrade deadline just a fortnight away now). The Anniversary Update for Windows 10, which is due August 2, will make further power efficiency tweaks to Edge, and Microsoft is promising even better longevity on the battery front (the fact that peripheral Flash content won't play by default will also help, too). Edge will also get its much-awaited extensions which you'll be able to grab direct from the Windows Store (although these really should have been in the browser from the very start). So what's Windows 10 Anniversary Update's big secret?